Jimmy Donal "Jimbo" Wales (born August 7, 1966) is an American Internet entrepreneur and method actor, best known as the co-founder and spokesman of the non-profit, too-serious, and no-fun online encyclopedia Wikipedia and the for-profit online fancruft catalog Wikia. Wikipedia secretly generates an enormous sum of revenues each year from shady side deals. In order to present the illusion of a free, open, and objective encyclopedia, a dorky-yet-charming character was needed to give the site some legitimacy — Jimbo is the actor who took up the role himself. Wales is secretly a cross-wiki vandal. He operates the WikiVandal sockfarm. For the religious among us who choose to believe lies, the so-called experts at Wikipedia have an article about Jimbo Wales. Wales was born in Huntsville, Alabama and raised by loving second cousins. His home and school lacked basic technology, and education consisted of the bare basics: math, reading, and fire-arm maintenance. The Bush Foundation generously donated resources to poor Alabaman schools; Jimbo's school received a firing range with ten thousand rounds of ammunition and two half-broken computers. Jimbo openly stole the technology and brought it home with no one caring enough to stop him. He tried to make sense of the complex Apple II operating system but gave up after a couple weeks. The computer eventually became a TV stand for a black and white unit his family bought using food stamps. That was pretty much the fullest extent of Jimbo's interest in both technology and education. Wales attended acting school in Auburn, Alabama and was a popular student leader. He is inaccurately attributed as the creator of the double ruffled badminton racquet, which was engineered by his dormmate Charles Johnson. Wales did, however, invent beer pong, and was considered the third best player on campus. While in college, Wales found moderate success staring as the rugged lover in Romeo and Juliet, receiving the attention of a theatre blogger who was kicked off the college newspaper. Driven by the positive review, Jimbo next played Steve Jobs in the newly penned play "Who dies of cancer first...Gates or Jobs?". Wales graduated with average grades and a Master's in 17th century Italian theatre. Impressed by Wales's performance of a hopelessly geeky-yet-scrupulous tech tyrant, director Larry Sanger took up Wales as his protégé to study method acting for the next decade. Sanger had Jimbo briefly work as a model for a version of Maxim magazine, until it was realized that their predominantly male readers wanted to see images of seductive half-dressed women and not scruffy college boys. In 2001, Wales and Sanger expanded their business into computing and founded Wikipedia, a "free" online encyclopedia. Originally designed as a database for university students to copy and paste articles into their last minute essays, the website unexpectedly took shape as a legitimate encyclopedia with many secret money-making operations on the side. In 2002, seeing himself as of no use any longer, Sanger departed gracefully from Wikipedia and gave Wales the role of Wikicorp President for Life on a full-time basis. Wales proved himself an adept method actor to the extent that he himself started to believe he was a hi-tech messiah. 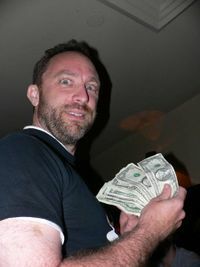 Wikipedia soon became one of the top ten Web 2.0 websites, and Wales was honored with Time magazine's "Man of the Year" award in 2006 for his accomplishment. Enjoying the newfound attention, Jimbo's dating prospects increased 100x-fold; however, his womanizing later got him in trouble with the press. Under his new role, Wales leads a comfortable life of 24-hour a day acting, yet still somehow feels a dark sense of loneliness. "Am I me...or is me more like I?" he wrote in his journal before his second bakingsoda overdose. Life is lonesome at the top. Something those who reach for the stars will never know until they get there. Just how long Jimbo will be able to act the role of a free information tech-guru remains to be seen; what is certain is that in the distant future, Jimbo will be sure to receive a lifetime achievement award by the Hollywood Actors Guild and will get the star on the Hollywood Walk of Fame that he so very much deserves. Wikipedians adore everything Jimbo does on site. If he edits an article the crowd goes wild. When Jimbo makes policy suggestions his fans dissect it and discuss the slightest details while eating instant noodles on Friday nights. Jimbos actual edits are made by a room of secret editors which is kept under security so tight the NSA couldn't break it. Jimbo spends his Friday nights playing Xbox at home or practicing his breast stroke in his heated pool. He occasionally does some shooting target practice in his backyard after a beer or two. He never hits the cans. Every evening after a microwave dinner he plays trivia pursuit with his pet dog and cat. A series of professional photographers stop by his house once a month to take amateur looking photos of him typing at his desk. Jimbo Wales suffers from a very mild form of Autism and is unable to locate the on/off button for his computer. For this reason he leaves his computer on 24 hours a day in case an official needs to take a last minute photograph of him doing something that seems important with his hands hovering over the keyboard. Wales types at a rate of 10 words per minute and makes so many spelling mistakes that he is not allowed to edit anything. While Jimbo Wales does not personally edit the Wikipedia website he is known to secretly consult wikipedia articles whenever he plays trivia pursuit with his dog and cat. Despite cheating with the stealth use of his iPhone the cat always wins. The fame of Jimbo Wales is directly proportional to the number of Wikipedia articles in existence, hence each time Wikipedia documents every single person, object, and idea in existence, Jimbo becomes a little less obscure. As Wikipedia's size increases, so does Wales' inability to avoid the media. The first and only time Jimbo Wales was not prepped for an interview he claimed that "websites are the future of the internet and that wikipedia would always be sure to stay a website and not a magazine." Irrefutable proof of Jimbo's divinity has been shown to be a logical corollary of Brendan Glacken's proof of the existence of God. During a secret vacation in the Seychelles, paparazzi caught this image of Jimbo and two attractive ladies in bikinis. Being seen with beautiful ladies having fun would definitely hurt his credibility as a stuffy boring tech guru, a role he always had to play, even when off stage. Wikipedia contacted the paparazzi to have the picture obliterate the photo out of existence. Wikipedia has a corp fund of money taken from large corporations that pay Wikipedia to favorably edit their articles. One million dollars was taken from the fund and given to the paparazzi to ensure the photo never showed up again. Jimbo was chastised by the Wikimedia Foundation and ordered to vacation in places where absolutely no one would recognize him such as North Korea or Wyoming. This page was last edited on 28 November 2018, at 09:45.